Top List of What Employability Skills are Employers Looking for? You are here : Resume Writing Service » Blog » List of What Employability Skills are Employers Looking for? List of What Employability Skills are Employers Looking for? Posted By Nathan On July 2nd 2015. Under Blog Tags: employability skills, what are employability skills, what employability skills are employers looking for . When people are first trained for a resume writing, a lot of emphasis is put on transferable skills. The problem is that most people don’t get the message. Usually, people will include skills that they think are supposed to be on the resume, but not necessarily the skills that employers actually need to see. This is more of a problem than it might seem. Just about everybody has this problem in some form. If you have a functional resume, for example, which is very much based on your skills, you sink or swim based on the quality of your skills entries. If your resume hasn’t been performing very well, you can assume that your skills section is letting you down. What are transferable skills, and how do you define them? 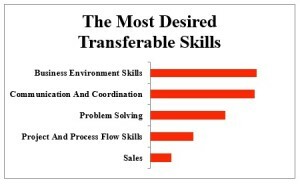 “Transferable skills” are skills which may be transferred from one role to another. This expression is the recruitment industry standard expression used to identify core employability skills. Transferable skills may also be defined as the skill sets required in a particular role. If you’re an accountant, for example, you need a range of accountancy skills and qualifications. Your skills profile very much defines your employability in a particular role. The transferable skills that employers really want for any position can be mapped out quite easily simply by reading the job ad. The required skills also have a range of correlated skills. For example, a manager’s job will require a full suite of related skills in basic business accountancy, resource management, and an entire syllabus of practical experience. Mapping out required skills can also be a very interesting exercise in distinguishing between the jobs you want and the jobs you don’t want. In a multitasking environment, skill sets do spell out what the job is all about. To give an example – If you saw a job advertised which required a Master’s degree, inventory management, cleaning and stocktaking, would you say it was a good job? Would you say that skill sets imply that the person in this position will be performing a lot of different types of work? Believe it or not, a job like this actually does exist. It’s an internship, and it pays $20 an hour. The question is, do you want a job like that? What are employability skills? Whatever type of job you search, managing your transferable skills is critical. Best practice is to create a list of categorized core skills based on key job requirements. As you can see, there’s plenty of room for listing related transferable skills in each category. Mapping out your skills in this way on your resume makes a lot of easier for employers to see the scope and depth of your abilities. Next time you fill in your skills section on your resume, try listing your skills this way. You’ll be surprised how much better your resume looks. For more information and a fascinating insight into how Ph.Ds. manage their transferable skills see this link. Images are taken from: professionalresumewriters.net, careerbright.com.